I have long enjoyed the webcomic RealLife. The first strip was published on November 15, 1999 and Greg Dean, the author, has been putting out new strips ever since. Though I didn’t start reading the comic until around 2003, I have read every strip. The majority made me laugh, some just made me smile, but some were so hilarious that I decided to bookmark them. 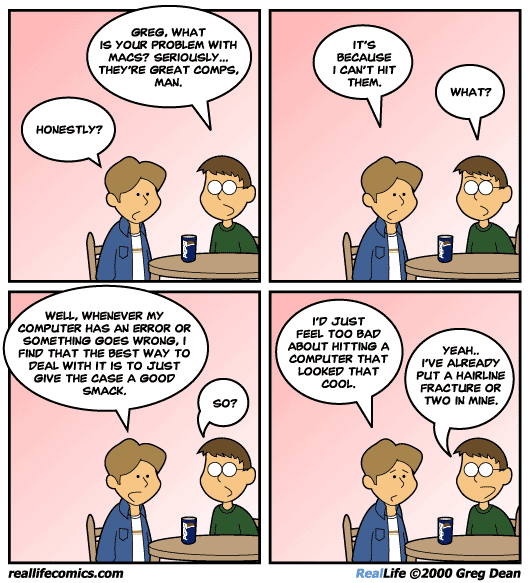 And instead of keeping those bookmarks to myself, I will share my favorite RealLife Comic strips with you. Tell me which ones you like best in the comments!